Menopause Advantage Reserveage Nutrition is a natural supplement designed to restore hormonal balance in the female body. According to the manufacturer, the active ingredients in this particular product have the ability to calm the body as it goes through hormonal changes, and support the cell youth. In regards to the specific side effects it can address, Menopause Advantage Reserveage Nutrition is designed to reduce the intensity and occurrence of hot flashes. We wanted to learn more about this product, especially since this company has received many accolades from women’s wellness magazines. What Does Menopause Advantage Reserveage Nutrition Contain? We notice some great phytonutrients being included in this formula. Some proprietary blends are present, as well, but we cannot say, hand on heart, that Menopause Advantage – Reserveage Nutrition is a complete product. There are many herbal extracts that we do not see here, such as chaste berry, valerian root, or the best support for menopause supplements, ammonium succinate. Other products on the market may be more efficient than this one. The recommended dosage is two pills daily. A bottle with 60 capsules costs 30.49USD, which is in the same price range with similar products. We were unable to identify details on their refund policy on the manufacturer’s website, so any issue you may have must be addressed directly with their representatives. 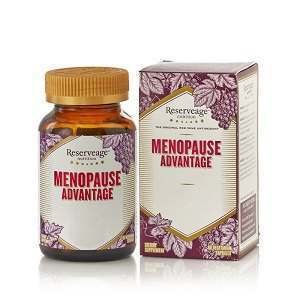 Menopause Advantage – Reserveage Nutrition sounds like a good, reliable product. However, for the price, we would have loved to see more active ingredients being included in the formula. While black cohosh and dong quai are both great herbal extracts used traditionally in treating the symptoms of menopause, others could have been added for a more potent effect. Jackie Horowitz	reviewed Menopause Advantage	on April 1st	 and gave it a rating of 2.